Nick is the First Shiloh Shepherd to become a part of a READ (Reading Education Assistance Dog), what these dogs do is go into libraries and schools an sit with children between the ages of 5-12, while the kids read to the dogs. This program is a sponsored thru Therapy Dogs Incorporated and the Delta Society. READ originated in Salt Lake City Utah and there are only 745 dogs that involved in this program within the US, Nick being one of them. READ has had much success with its programs. Most of the children who participate have reading disorders, problems with reading comprehension, difficulty reading out loud in front of a classroom, just to name a few, but any child is allowed to participate in this program. They have found that children enjoy reading to the dogs because the dogs don't judge them. By reading to the dogs it has shown great improvement in children, they feel more relaxed, the attendance seems to be better, they want to participate in school activities. Nick attended her first session last month and she was the hit of the Library. The children have to sign up to read to the dogs and it seemed that just about every child came back twice to read to her. The kids just loved her and she did extremely well. After this Nick will have bookmarkers with her name on it and her picture stating that they have read with Nick tonight. I can't tell you how rewarding it feels to be part of this new program. Nick is just remarkable, I wasn't sure how she was going to handle the situation, but she is a fabulous representative of the Breed. I can only say that after just one session a lot of children are looking up Shiloh Shepherds and asking their parents if they can have one. By Nick doing this program she has opened the doors for Shilohs everywhere. She can now go in to any library or school and do what she was taught to do--let the Children read to her. I am very proud of Nick. 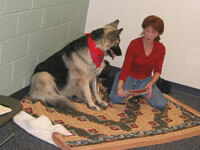 Anyone wanting to know more about the program can visit the Therapy Dogs of Vermont website.